An alternative to surgical chin implants available in Perth. Change the contours of your chin with a chin filler to achieve the look you desire. With the support of her dedicated team, Dr Joanna Teh provides chin fillers to clients from across Perth. This treatment is proven to be safe and has been taken advantage of by hundreds of clients. Talk to Dr Teh about the look you want and she will help you achieve it. Chin fillers are suitable for individuals who want to refine the shape of their face. This ‘lunchtime’ treatment can be administered in a short appointment, with minimal downtime. As with all our treatments, an initial consultation will help us to understand your goals. It is now possible to change the shape of your chin without painful, expensive surgery. You can rest assured your treatment is conducted to the highest ethical and professional safety standards. If you are ready for a change, book a consultation with one of Perth’s most experienced doctor in non surgical cosmetic treatment. This client wanted to lengthen her face shape to give her a more V-shaped face. Dr. Teh injected a chin filler into her chin to sharpen her chin and lengthen her chin to create the look she desired. This client was keen on improving the look of her cleft chin. She consulted Dr. Teh to explore some non-surgical options and Dr. Teh recommended for her to get a chin filler injection in the dip of her chin. She was very happy with the instant results of a smoother-looking chin. How long will my Chin Filler last? Is chin filler treatment painful? Are there any side effects from having chin fillers? Will there be downtime after my chin filler treatment? How do I know if chin enhancement is right for me? Can I go back to my daily routine after having chin filler treatment? Will people be able to tell that I’ve had a chin filler treatment? Who will be doing my chin filler consultation and treatment? What is the cost of chin filler/chin enhancement? 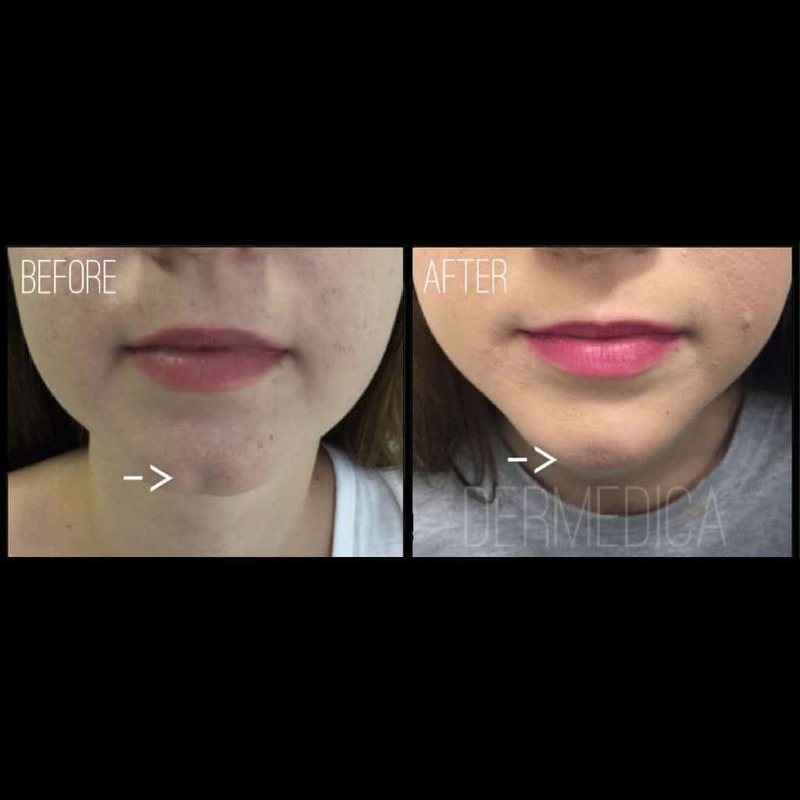 Why is should you consider Dermedica Perth Cosmetic Clinic for your chin enhancement? Why choose Dr. Teh for my chin filler treatment? Chin Enhancement is a procedure otherwise known as Chin Filler. It is a non-invasive, non-surgical technique of changing the shape of your chin to improve the overall proportions of your face. Before any filler is administered, Dr. Teh will personally assess your face and discuss your requirements before taking you through the treatment options available and the types of fillers to be used to treat your specific concerns. Depending on the amount of fillers administered, the type of fillers used, quality of your skin and the metabolism of the fillers in your skin, your chin enhancement will last anywhere from 6 to 24 months. The filler eventually gets absorbed by your body and your chin will return to its pre-treatment state. This is why many patients book regular treatments to maintain their ‘new chin’. Most chin enhancement fillers contain local anaesthetic so the procedure can be relatively pain-free. Dr. Teh prides herself on her experience with administering fillers with a gentle hand and will therefore ensure your treatment is comfortable. 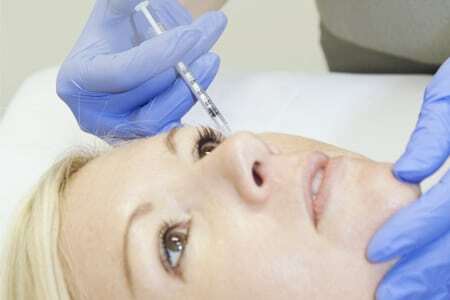 As with most filler injections, it is common to experience some mild bruising, swelling and tenderness. However, these side effects should last no more than two 2 days, and can be easily camouflaged with makeup if necessary. An in-depth discussion with Dr. Teh is vital to assess all potential risks and rare side effects before undertaking the treatment. Generally no. Most of our patients have virtually no downtime and most of them can go back to work or daily routine after the treatment. However, individual experiences can vary depending on your skin type, medications being taken or aftercare. To ensure your recovery is quick and hassle-free, Dr. Teh and her team will be available to assist you after your chin enhancement treatment if needed. If you have a square jawline but you would like to create softer contours to look more feminine, (a common request from women) chin fillers are a pain-free way to achieve this. If you have always felt like you wanted a more masculine look with a more chiselled jawline (a common request from men), this is a non-surgical way to get that look too. Asians are also fascinated by the V-shaped face, that their Korean idols have, and chin enhancement is the quickest way to achieve the look they desire. Dr. Teh understands Asian faces and proportions, combining her eye for Asian beauty with an understanding of how to work with Asian faces to successfully bring the desired V-shaped face to our Asian clients. If you think contouring your chin could help you put your best face forward, with no pain, immediate results, and no downtime, chin enhancement might be the right treatment for you. Most people get their treatment done within an hour and can go straight back to work or back to their usual daily routine immediately. However, you may want to be careful about doing sporting activities that can potentially injure you or knock your chin following treatment. In uncommon cases, the injected filler may migrate away from the injection site and gather into bumps or lumps beneath the skin, if knocked. To reduce this possibility, we also recommend not aggressively rubbing your chin in the week after treatment. This will depend on your aesthetic goals. If you’re after a subtle look that improves your aesthetics slightly, Dr. Teh will ensure the treatment is done to achieve a subtle but improved appearance. In some cases, people may not be able to tell you’ve had your chin enhanced; some people may even think you’ve lost weight when they see a sharper jawline or a more V-shaped face shape. However, some clients desire a more dramatic chin enhancement, in which case the results may be more noticeable. Dr. Teh will work with you to discover your desired outcome before making recommendations for your treatment. A thorough consultation is the best time to manage your expectations and talk about what you want your outcome to be. We are a boutique cosmetic clinic which specialises in personalised solutions for patients seeking non-surgical cosmetic treatments. Dr. Teh personally conducts all consultations and treatments to ensure patients will achieve their desired results. It is important that the doctor doing your treatment is experienced and fully qualified. Dr. Teh has 17 years of experience and has never had any major complications arising from administering fillers or treatments. Your treatment starts from $499 depending on the volume required, the type of fillers used and the skin type. Speak to Dr. Teh or book a consultation to get a thorough treatment plan worked out based on your needs. We strive to obtain a high patient satisfaction for all our clients and aim to make you feel comfortable through the whole experience. Dr. Teh has been administering filler injections for the past 17 years. The experience under her belt extends beyond her medical expertise. With her eye for symmetry and aesthetic beauty, Dr. Teh assesses each candidate thoroughly based on their desired results, individual budgetary constraints, suitable treatment options to achieve your desired outcome and confidentiality guaranteed for all consultations. 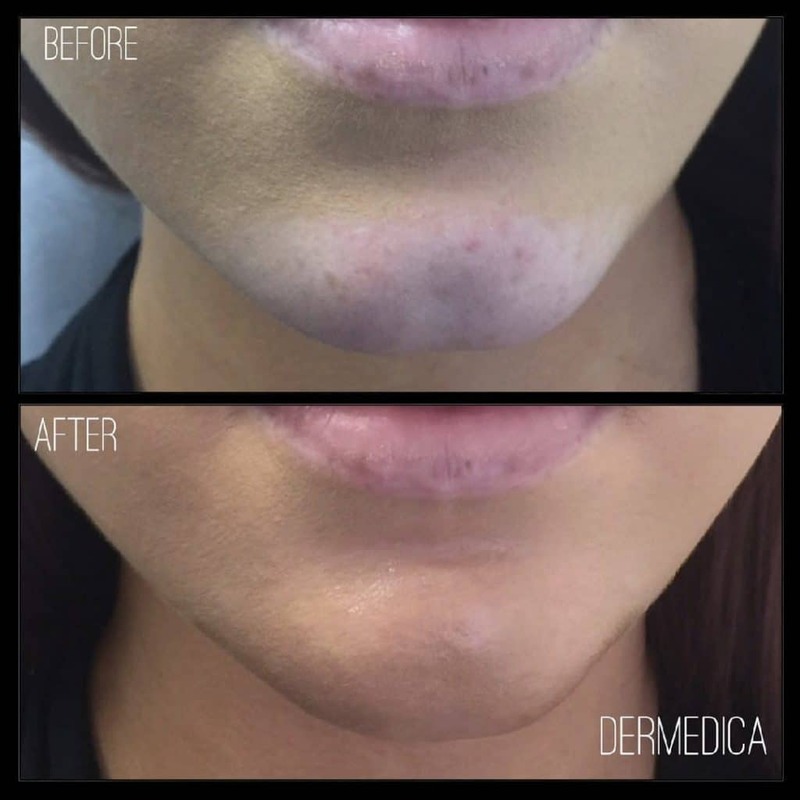 Dermedica Perth specialises in providing the best and latest technologies in non-surgical treatments. If candidates are found unsuitable to undergo non-surgical procedures, Dr. Teh will also be able to advise accordingly and point you in the right direction. If you have an idea of how you want to look but are not quite sure if this is the right treatment for you, Dr. Teh can advise you of your available options at your consultation. Dr. Teh has also worked on many Asian clients since 2000 and specialises in knowing what works well with Asian faces.